Once upon the same time, there was a boy. His restless spirit and broken heart were qualities bestowed upon him by the world. Like a bird with a broken wing, he’d all but given up on life and life had given up on him. One day, the boy met the girl. She noticed he was damaged, so she offered to mend him with some of her love to which he gratefully accepted. To their dismay, she could not repair him and as a consequence, her heart was now broken too. The girl told the boy of the gracious King and how he’d mended broken hearts before, so the girl and the boy set out on a pursuit of healing. Along the way, the boy spotted a shortcut in the shadows of the forest. The path was dark and unfamiliar, but she followed him. It wasn’t long before the girl realized they were lost. She begged the boy to turn back and heed the map, but the darkness surrounded him. The dark forest brought out a wildness in the boy that the girl hadn’t expected. The boy defended the dark path but soon fell into a pit. As she peered down at him, she could barely recognize his face. Knowing she couldn’t get him out of the pit on her own, she left him in the pit and went for help. The girl followed the map that led her directly to her King who had been waiting for her. With His faithful needle and gracious thread, He mended the girl’s heart and made her brand new- the princess she’d been all along. The girl and her King went back for the boy. As they approached the pit, the girl knew death was near. In all His glory, the King sneered at death and death fled the path. When the boy saw the King, he remembered His face. He knew he had seen Him before. The King rescued the boy and made him brand new- the son He’d never forgotten. With the strength of the King, the girl and the boy soared through life never knowing what the day would bring nor worrying about it either. Normally, I'd say, "The End," except it wasn't the end; it was only the beginning. Like the boy in the story, our loved one’s issues were present before we ever came into the picture. Most of us fell in love already familiar with their darkest parts. And Mama's, well, you know all their parts. We love them so much we try to help them ourselves, but these aren’t our problems to fix. Our job is to love them, pray for them and lead them to the feet of Jesus. Often, instead of getting to the root of our own issues, we spend all of our time getting to the root of our loved one’s problem. Like the girl in the story, trying to fix someone else only breaks us down. Letting go of control and giving our loved one's fate to God requires a lot of grace and trust. Click to Tweet: Instead of getting to the root of our own issues, we spend all of our time getting to the root of our loved one's problem. How can we ask someone to trust God’s plan when we haven’t trusted God enough to let go in the first place? Let us never forget that God loves them more than we could ever imagine. The best way we can help them is to help ourselves. "What man among you, who has a hundred sheep and loses one of them, does not leave the ninety-nine in the open field and go after the lost one until he finds it? When he has found it, he joyfully puts it on his shoulders, and coming home, he calls his friends and neighbors together, saying to them, ‘Rejoice with me, because I have found my lost sheep!’ I tell you, in the same way, there will be more joy in heaven over one sinner who repents than over ninety-nine righteous people who don’t need repentance." If you believe God sent His son to die on the cross for our sins, then you have been pursued. To be a believer means you were sought out by God. While we were pursuing our loved ones (in an effort to fix them) God was pursuing us as His wayward daughters. We were not created to be "Bar Wench #2" in our fairytale! God's daughters are main character material… can I get an “Amen?!”. In the Parable of the Priceless Pearl (Matthew 13:45-46), it says that we are pearls sought by the Kingdom of Heaven. We are the pearls He gave everything, namely His Son, Jesus Christ, for. To be pursued by God means that He is always reaching for us. He is tugging on our heart strings and putting events in place to win us over. He wants our love in return. He never stops. When we finally reach for God, we aren’t making the first move; we’re responding to his pursuit. Our loved ones may disappoint us, but Jesus never will. He passionately pursues us the way we once passionately pursued them. To God, we are 'the one'. Though we may be flawed and imperfect, He is relentless in His desire for us. Click to Tweet: As daughters of the One True King, let us surrender our own hearts to be healed by our King. Let us release the burden of control of our loved ones to God. Let us surrender our own hearts to be healed by our King. Let us see ourselves through the eyes of our Father. Let us receive His grasp when we feel His reach. Let us put on our crown so we can be free. Are you ready to take your relationship with God to the next level? Reach for the stars! It's time to learn who you are to Him. 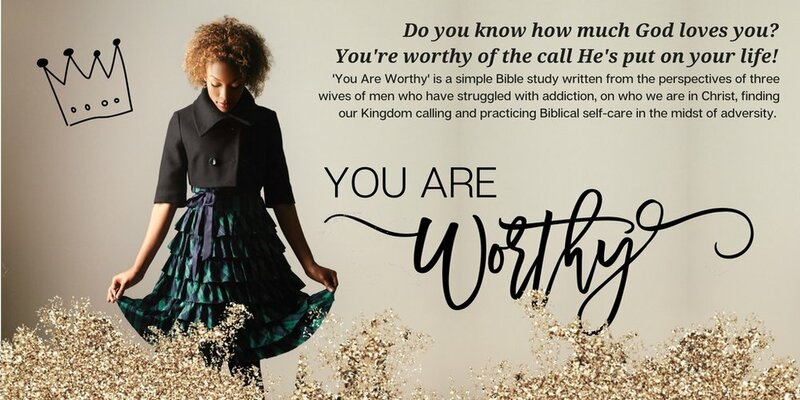 Join us in a simple, four-week Bible study, "You Are Worthy," as we examine the things we've allowed to define our self-worth while finding new confidence in our Kingdom identity. Can an Addict Stop Being an Addict?